Most of us intend for our churches to be safe spaces, but we often need a bit of help. As we are often reminded, good intentions are not sufficient to create safe spaces. Good intentions must be paired with empathy, and understanding of the varied needs of different people. 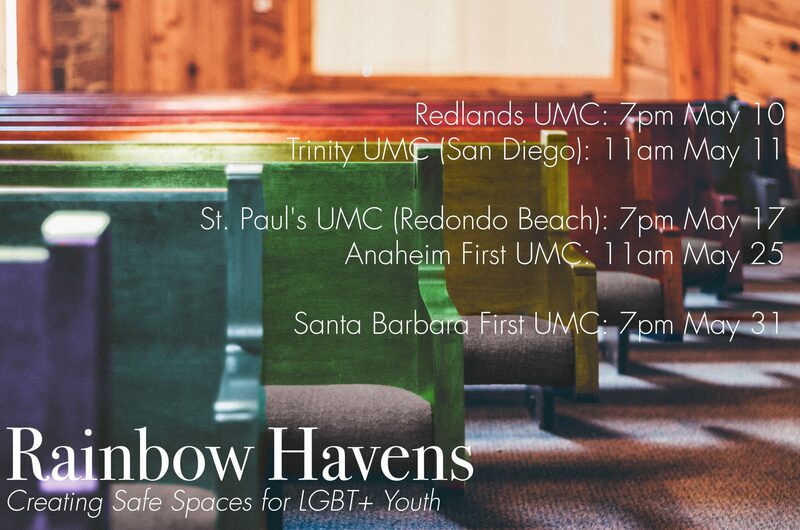 Rainbow Havens, an initiative of the California-Pacific Conference Leadership & Discipleship Essentials Ministries Team, will help the adults in your congregation learn about specific, concrete ways your church can be more welcoming to LGBT+ young people. You will learn about the language and vocabulary relevant to LGBT+ young people. Rev. Barnes brings years of advocacy in the LGBT+ community alongside years of youth work at Hollywood UMC to these discussions. These events will focus specifically on the needs of LGBT young people, because their needs are somewhat different from older LGBT adults. These events are safe spaces for local church adults (especially, but not limited to, church leaders) to ask questions, even if you’re a bit nervous about asking a question poorly. Each location will have an hour-long presentation from Rev. Denyse Barnes, followed by about thirty minutes of discussion. Afterward, Rev. Barnes will be available at a local restaurant or coffee shop to sit with those who wish to continue the discussion to learn more about creating safe spaces for LGBT+ youth. Rev. Barnes is actively seeking LGBT+ adults who wish to participate in this event. If you are interested in participating, please contact Denyse directly at denyse@hollywoodumc.org. More voices create a richer experience!